This recent product installation comes from Synthetic Turf International dealer Pete Albanes of Synthetic Grass Greens/STI of Greater Maryland. Its purpose was to utilize an urban green space in Rockville, Maryland that was difficult to maintain and use. From Baltimore to D.C., functional and appealing green space is difficult to find, which makes for a perfect use of synthetic turf. 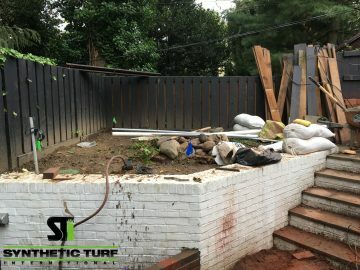 Pete and his team decided to create a beautiful eco-friendly lawn environment using Synthetic Turf International® Softlawn® Kentucky Blue Plus and UltraBaseSystems® Champion panels (* without the use of stone base). 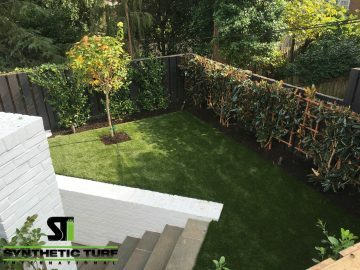 UltraBaseSystems® are a multi-patented systematic approach to creating the next generation of base construction for synthetic grass, concrete pavers and athletic court tiles. UBS is revolutionary technology in a category of its own, a true game changer. For more information, please visit their website at http://ultrabasesystems.com/. 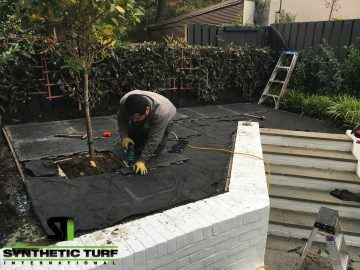 This install resulted in the customer gaining a relaxing green space with plants and an exceptional looking area with a completely permeable sub base.